Coming from a family of military veterans, it is an honor for me to announce our 2018 MISSION UNITED Campaign. 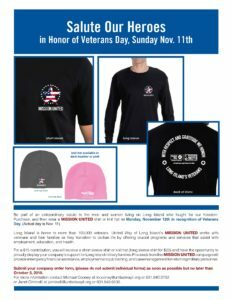 Monies raised from our MISSION UNITED t-shirt and hat campaign, support United Way of Long Island’s veterans initiatives, which provide Long Island veterans and military families with emergency financial assistance, job training and key referrals to secure careers, as well as vital case management services. Thanks to you, last year we supported 363 veterans and their families with a multitude of services. 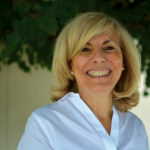 Our goal is to help even more veterans and their families this year and we can with your support!. Please fill out the order form to the right and return your order to us no later than October 5, 2018. It is customary to thank our military men and women for their service to our country and today we thank you for supporting them.